Hyperloop construction will occur next year with the first full-scale track. 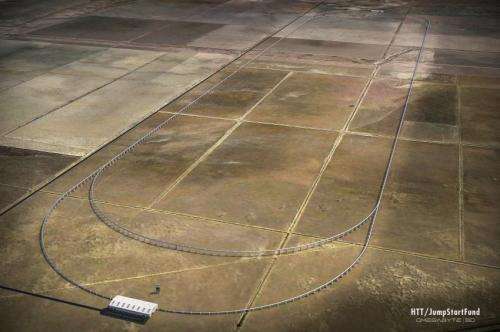 Hyperloop Transportation Technologies announced it plans to start building a five-mile track in central California in 2016. Consider this an urban Hyperloop system for California, and not a dream on paper but quite real. The company, Hyperloop Transportation Technologies, reached an agreement for the working Hyperloop passenger transportation system on a five-mile stretch in California's Central Valley as part of Quay Valley. This is referred to as a 21st-century town, also planned for the future. Wired reporter Alex Davies referred to Hyperloop Transportation Technologies "as the company that wants to move the revolutionary transit system out of Elon Musk's brain into the real world." Entrepreneurs took Musk's plan to turn the plan into reality, resulting in Hyperloop Transportation Technologies, a company founded by JumpStarter. The company CEO is Dirk Ahlborn. One noteworthy aspect about the announcement is that the 2016 track initiative is not a scale model. "It's the real deal," said Davies. Running speed will be reduced on the shortened track from Hyperloop's full potential. While it's not the full-scale version, it will be using "magnets and fans to push passenger pods through five miles of depressurized tubes at speeds of up to 200 mph," said Rob Crilly in The Telegraph on Saturday. The track site is interesting in and of itself—Quay Valley is a planned community to be built from scratch, said Wired, on 7,500 acres of land along Interstate 5, midway between San Francisco and Los Angeles. On February 26, Hyperloop Transportation Technologies announced a formal agreement with the Quay Valley developers for an installation of the Hyperloop along a five-mile stretch. "Quay Valley will be a model town for the 21st century, a self-sustaining community," according to the "About Quay Valley" website. Under a concept dubbed the "New Ruralism," the community is to operate on 100 percent solar power and set "new standards in self-sufficient energy use, water conservation, resource reuse and environmental responsibility," a "global showcase" for sustainable energy, conservation, pollution reduction and "a higher quality of life." Quay Hays, CEO of GROW Holdings, Inc. (Green Renewable Organic & Water), the master developer of Quay Valley, stated in the press announcement that the Hyperloop was "the ideal clean community transit system for Quay Valley." What is the Hyperloop? A capsule inside a tube, it will enable people to do a trip between LA and San Francisco in only half an hour. This will be a transportation network of above-ground tubes. With extremely low air pressure inside those tubes, said Wired, capsules filled with people zip through them at near supersonic speeds. The vision involves a 400-mile stretch of tubes carrying passengers. According to the Hyperloop company's announcement, the system allows a capsule with 28 people to travel through a tube with a low pressure environment of 100pa at 760mph, "similar to an airplane in very high altitudes but on the ground," said the company. Today, said Crilly, "friction limits the maximum velocity of high-speed trains. Instead the Hyperloop system would use tubes at very low pressure to reduce air resistance and the capsules would run on a 'ski' of air - rather than wheels - a bit like a puck on an air hockey table." Musk has described the design, said the BBC, as a cross between Concorde, a railgun and an air hockey table. Do they cool the tube air as well? This would increase the speed of sound. So, they're building a 5 mile loop, in the middle of a 7,500 acre development. anywhere close to 200 mph, for a 5 mile run???? At 200 mph, the entire run would take ~1.4 minutes. The speed of sound isn't really the matter because the passenger pod isn't moving at the speed of sound relative to the air. It's travelling with the air along the tube, and the air is going around in a big loop. The whole concept is a rehash of the late 19th early 20th century pneumatic subways, where carriages were pushed on rails along brick-lined tunnels with large blowers. The idea of using low pressure saves on having to produce a large mass-flow through the system, which reduces pumping losses. It's not a vacuum train - once the pod is injected into the airstream, the stream is supposed to carry it along to the next station. It also acts as a kind of energy storage system, because there's still a significant mass of air in a 5 mile long tube going 700 mph. With a sufficiently large tube diameter, the friction is small enough that it will just keep going round and round for a long time. Part of the idea is that surplus renewable energy is used to accelerate said air and keep it moving. Yes, the air moves with the cab, but you still need to consider the air moving past the tube wall. However, there is very little air in the tube, that's kind of the point - makes it efficient. Let's just hope it doesn't turn into the monorail episode from the Simpsons. But it's always good to try out these things in a real-size setting and not just a scale model. Though I still wonder whether there isn't a significant difference when the loop is relatively short to when it's comparatively long in terms of energy requirements for keeping up the low pressure and also keeping the air column moving. Eikka: Having the air moving with the pod would eliminate the speed problem. I hadn't thought of that, thinking that the only use for the air was as a cushion between the pod and the tube wall. Take a sheet of paper and lay it on a flat table, then blow over the edge of the paper closest to you; the paper lifts off and starts to glide away. That's how it works. The pod travels slightly slower than the airstream, so the air rushing past the pod causes it to float off the walls. The only problem is with bends, because the pod is denser than the air and will push at the outer curve, so they need to place some sort of magnetic cushion in every corner to keep it from crashing the wall. Of course they are so dumb the engineers did not consider the corners - Doh! A Teflon safety coating and Venturi air sprays would work, but No ... Instead lets speculate on complexity and Introduce a magnetic cushion. Instead lets speculate on complexity and Introduce a magnetic cushion. The system is already supposed to employ maglev technology to accelerate and inject the pods into the airstream. The pod will probably have magnetic coils, and the rails a linear motor, which means adding strong magnets to the outside of a curve will keep it afloat. The issue is that the airstream is pushing the pod from behind, not from the front, so getting the pod to turn along with the airflow is difficult. The heavier pod will settle on the outside of a turn, squeezing out the air underneath it. As far as I can see, the pods are only supposed to travel in the straight tubes, and the only time they curve is when the pod diverts into a station. AGW did it, the science is settled! PRTAYLOR - Above has the better BS detector herein. This is not a demonstration of the hyperloop technology performance or claims. At best it's a test of some of its peripheral hardware. As for the HTT CEO's press release - you have to be breathing your own exhaust to think the demonstration was "the real deal." Worse, if he thinks the concept is either original or new. It's just Musk's borrowed hype on many before him. Anyone who buys into advanced ground transportation concept development in the US ignores the historical bureaucratic and political quagmire that any such enterprise will find itself slogging through for eternity and the costs this incurs. It isn't the lack of technology that stops the commercialization of these concepts.